Imagine you're wandering alone through a vast desert–the landscape is barren and the sun is blazing. There are no landmarks to guide you, but accidentally going in circles could mean death. Whatever direction you choose, you need to be able to head straight. "For flies crossing inhospitable territory, flying around in circles would be really dangerous–they're less likely to find any food or water," says postdoctoral scholar Ysabel Giraldo, the study's first author. "Surprisingly, fruit flies are seasonally found in environments like the Mojave Desert. They must get there from somewhere, and once there, they must figure out how to get around." Giraldo and her collaborators found that fruit flies navigate using the sun as a landmark. 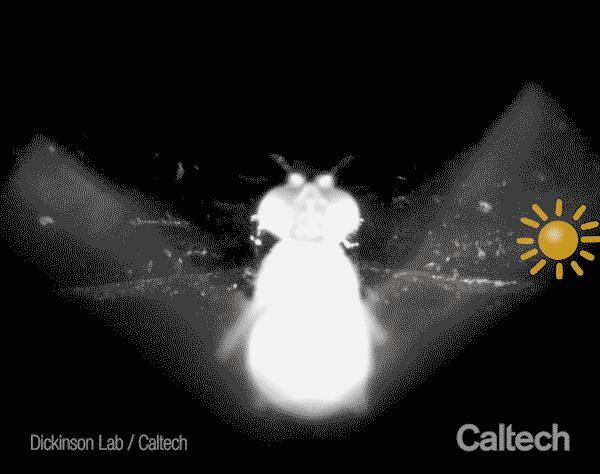 The researchers placed flies in a "flight simulator"–a kind of virtual reality where they are held in place but can still move their wings in response to visual stimuli. The researchers found that a fly will fix a small, bright spot (the simulated sun) in one position within its field of vision and fly straight with respect to that position. When the team removed this landmark and reintroduced it a few hours later, the same fly could remember and adopt its former orientation, or heading. Each fly they tested selected a different heading, suggesting that under natural conditions, flies in a group would disperse in many directions. "Insects have been navigating for many millions of years, so we think of this as a very ancient toolkit," says Giraldo. "We know a fair bit about navigation in other insects like Monarch butterflies and locusts–seasonally migrating insects whose behaviors are noticeable or affect us directly. Although relatively little is known about how fruit flies navigate and disperse, the availability of genetic tools for Drosophila makes them a powerful system to understand the mechanisms underlying behavior. In fact, because the anatomy or architecture of Drosophila brains is very similar to these other insects' brains, what we learn from fruit flies is likely to be relevant to them."